Today I received a question and I thought I would share it with you. This DOES NOT pertain to T-14 or Cedar Suites wood houses which use winch / pulley systems and high grade poles designed for the weight of these houses that weigh from 65 to over 100 pounds. 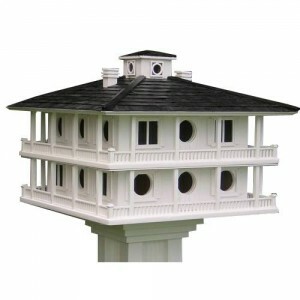 I have a purple martin wooden house that weighs 35lbs. I need to purchase the pole and the plate to set it up. Please recommend the best pole and plate to use to set it up. bought? DIY Purple Martin houses that are just flat wood on the bottom, folks mount it to a 4×4 wooden post bought at a lumber yard or home improvement yard. The weight of the house will make it too heavy for a telescopic pole. houses have been tested and are proven to support the weight they are designed for. 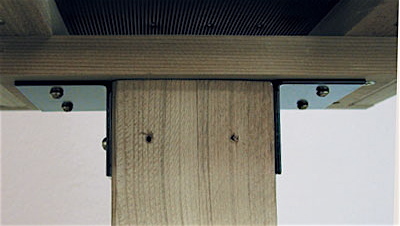 If you mount to a wooden 4×4 wood post then the base of the house can be screwed onto a post using “L” brackets, also found at any hardware store for under a few dollars. Unfortunately many wooden purple martin houses sold on the web are poor choices to actually house martins. They are not built with martins in mind. Which is why we do not sell them. One good tip when buying ANY purple martin house is beware of the term “Easy end of season cleanout” or” top level detaches from the bottom”doing nest checks you want to be able to selectively open compartments. Opening a whole floor at a time is just ASKING for trouble. I mean, where are you supposed to put that portion of the house while you check the other section? On the ground? What about if a nest is close to fledging? The nestlings would be jumping all over the place. Never mind the issues with the posts that these houses are designed to be mounted on. Decorative at best, way to short or impossible to reach at worst. And I haven’t even mentioned the fact that there are no starling resistant options and the compartments are WAY too small. Any good purple martin house will have large 6×12 (or even 6×11) compartments and the ability to selectively open portions of the house with minimal disruption. Easy to lower and SREH options show that your and your martins comes first. 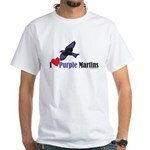 This entry was posted on Thursday, June 2nd, 2011 at 6:21 pm	and is filed under housing maintenance, product review, Purple martins, www.purplemartins-r-us.com. You can follow any responses to this entry through the RSS 2.0 feed. Both comments and pings are currently closed.